This 3 bedroom house at Waharoa near Matamata sold for $175,000. Bayleys sold 21 of their 29 Auckland auction properties this week, and in Hamilton three of the five auction properties were sold. Highlights of the Auckland auctions included a Devonport villa that sold for $2.3 million, a Freemans Bay house that sold for $2.69 million and a 1960s, two bedroom brick and tile home unit in St Heliers that fetched $790,000. 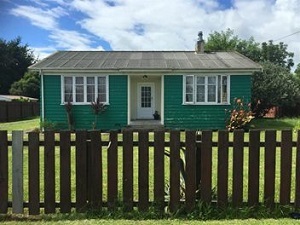 At the Hamilton auction, a two bedroom house that was described as needing some TLC (pictured), on a 1012 square metre section at Waharoa near Matamata sold for $175,000, while the auction of three lifestyle blocks near Cambridge was postponed for three weeks. 24a Manawa Rd sold for 56% over CV i.e. $2.124m vs $1.36m. This may not seem like a high-end price in DGZ but I can assure you that it is a fine old price considering it's only a cross-leased 3-beddy brick and tile. This has pretty much confirmed to me that the market is back in full force! So many serious buyers out there who are under-bidders. I have witnessed this myself in 3x separate auction rooms this week. Young couples are not scared to engage themselves in bidding frenzy pushing up their bids to well over $2m but still came out empty handed. Sold signs left right and centre in DGZ - you will know this is true if you live in the area, driving around, seeing the green, yellow & red sold signs smiling at you in every corner. Best time to sell is NOW. Manawa Road house sold in March 2011 for $937,500. That TradeMe app is great...the power of the Internet! It has had some major renovation work done on it though. It would be interesting to know how much that cost..200K ? Would likely have fetched 1.8M without renovation. Good quality stand alone houses, preferably with nothing shared, are going to increase in value in Auckland. That's been the case in Canada. The so called "major renovation work" is nothing more than a minor decoration work including a lick of fresh paint, plus a new big paved patio all the way to the fence-line. Still single level and no upstairs added. Yeah but I got a quote for a small bathroom renovation and it was 30K. I think a lot of people who complain about the high cost of houses forget how much things cost. A new bathroom and kitchen can easily set you back 60K. I wouldn't be surprised if that lick of paint cost 100K+. Check the photos on the link above. Perhaps an expert in tarting up houses could advise us? it's never really been my thing. I'd be surprised if it cost them more than $100k. Photos can be tweaked to make them look amazing....I know too well, but in this case I actually attended the open home a few weeks ago so I have some idea. Also a cross-leased 80's townhouse with 1/3 share of 1000sqm land at 3/266 Victoria Ave sold for $1.91m at auction 3 nights ago. CV is $1.3m so still a cool 47% over CV. House is in need of refurbishment with rotten carpet, old cabinetry in the kitchen and old paint. From the satellite it looks like it is semi-detached too. Also sharing a driveway. Nice area though if a bit congested in rush hour. Because the frontal photo, top right, looks like another house joined to it. Also earth-view shows three houses almost touching if not touching. That's it. Yes the earth-view is misleading as the site is elevated down from the main street (the entire Vicky Ave is abit like that). They are actually all stand-alone townhouses but very close to each other. A crap house on a crap section. Only $1.91m. This is so out of wack, it is scary. Which TradeMe app is that Zachary pray tell? The only one that I can see just shows some random QV info or CV and doesn't actually tell you the previous sold price on an address, or is there another tab some where that provides the sold price info on an address? And can you post us a link as we would all like to see it. Oh dear...I'm surprised people still don't know how to get previous sales stats *ahem* They are all free and have been for quite a number of years. The latest tool is https://homes.co.nz/ - Enjoy! Thanks for the link doublegz and Zachary, the only more obvious site that provide the sold price info is QV but you generally have to pay for that info which is annoying. Shame that Trademe can't make the property sales info more obvious, since it would really help FTB etc.. Allowing people to estimate the value of property improvements when there's an opportunity to negotiate on a purchase price. Nice that site just valued my house at $900K. Probably not that far off the mark but was thinking more like $800K, the market has gone nuts. Still I have to laugh, couldn't get a flatmate once as Long Bay was claimed to be "Too far out", how things have changed. Hard to fault being able to walk to the best beach on the North Shore. I use the TradeMe property App for Apple iOS. I think it only works as a mobile device/tablet App. There is an android one too. An iPad is perfect for viewing and on the main page, top left corner, you will see three tabs, For Sale, To Rent and Sold. Sold is the one you want to find out recent sales figures. Beats paying QV five bucks! Why are people selling? Won't they keep going up. Various reasons...people going through divorce, looking to upgrade/downgrade, trying to get into certain school zones, baby-boomers seeking peace & quiet etc. When you think about it, they're all pretty common really. Someone with a high value rental in central Auckland may think it better to sell and get two or three rentals in West Auckland. YAY! Let's celebrate prices going up and making life harder for New Zealanders!!! Time to party like it's 1999!!!! "...making life harder for New Zealanders" - Actually all the successful buyers are indeed New Zealanders. I think what you're trying to say is "...making life harder for me". I like to think we are simply reporting the latest news. We have a financial interest it is true but if we didn't we wouldn't be reporting in and these comments are directly related to the article so very on topic. Too often, perhaps, we descend into political/social-justice bickering. However SpaceX you do remind me of when I was younger. You need to look out for yourself and I am sure you will do alright. I think the Te Atatu area is a good place to start with the new motorway infrastructure being built. I started in the poor part of Glendene. I'd recommend any FTB especially if you have small children as they have excellent schools out there, to look at Titirangi, Laingholm, Parau and Huia. Still within commutable distance to the CBD and less traffic than most areas and with relatively affordable property within safe communities. Nope, would never want to live in that pretentious shithole. You need to be a certain type of person to live in Remuera and Epsom, personally the people I have met from these areas generally make me want to puke. I'm not saying I like South Auckland and I really don't like West Auckland either but something middle of the road with normal people is nice. Grew up in Remuera and had the best of times 'til I left in very early '70s. Now when I drive through, it conjures up images of what a medieval circus or freak show may have looked like. (Been rural living ever since). Now you turn your back and laugh at the place you grew up in, that says it all about your loyalty and what kind of a person you are. Have you two thought of starting your own website? Add some Ricky Martin tracks the background and free oil to slather those large egos. Thanks. Yeah, I am smart as, good looking and ambitious. Working towards doing my CA then will be starting my own business or possibly concurrently. And if I don't get a property soon, then it's probably time to get out of this country. Keep the dole bludgers and lazy people, replace me with 3 immigrants. I will be voting for NZ First or whoever promises to stop the cancer. There is actually good news on the horizon for honest New Zealanders. I was speaking to a senior guy in finance last night and he had some interesting things to say. He said there is a global summit in the UK next month on Money Laundering. It is being headed by David Cameron. -Offshore Trusts will effective become a thing of the past as full underlying exposure will be required. -there will be a global initiative to freeze and seize the assets of the dodgy assets. He said he expects buying of property by offshore trusts to dry up. He said although JK will be a laggard in addressing the issue he will have no option but to toe the line. Headed by David Cameron? Fox, here is the key to the henhouse. I would like this to be good news, but the truth is nothing will change. We all knew what was happening last election, and yet people were still happy to vote for the liar. Sometimes I hate this country. Is it big enough to be the big event everyone is so petrified of? I can hear the champagne corks popping, or is that the bubble? Yes us baby boomers are certainly shafting X and Y. That means X and Y have to have to a good strategy and save very hard for a house deposit. Not easy when you have such an urge to travel and live well. Yes living well is only for the boomers they deserve after slogging their youth to buy a house 3x their wages. X and Y should feel gratefull for the wonderfull world the boomers inherited and have improved. Thanks Frazz.It was hard growing up as a boomer. No car, no cell phone, minimal clothes and sports gear, limited eating out opportunities,limited travel prospects etc etc. As a result we built up a house deposit fairly quickly as nothing to spend it on. As I said you need a clear strategy and a lot of discipline. Not many in X and Y have the latter when it comes to saving. Must have that OE and then get upset when they come home and cannot live like mummy and daddy. Sounds horrific Gordon your early days. So glad you manged to come through it unscathed with free education and are living well now. I paid fees Frazz and worked all summer to help fund the next year. No car and certainly no overseas trips unlike X and Y. @ Penguin; Wonderful! I really hope that actually has an effect, though if it does you might see a bit chunk of Auckland's housing being seized as dodgy assets. Could be a good thing as it would free up a lot of those land banked and empty homes scattered around the more expensive areas. Not a bad idea. It really does frustrate me when I drive past those ghost houses...you can sort of tell at night time when there's no light in the house. Quite a few of those in DGZ I must admit, just facts nothing more. Here's an idea I have advocated many times and you seem like the perfect person to do it since you are so obsessed with attending auctions and keep track of sales. This applies to ZS too. Make a website which has a database comprising of all sales, and whether the houses become tenanted/occupied or left empty. Keep track of the buyers with all 'relevant' information. I believe someone did this in Vancouver. Great idea SX they obviously have the time and nous. Little bit more work however than raising ones hand at an auction to outbid FHB. Will see if the rubber hits the road. Definitely obsessed with the price of housing. it's sickening. All people talk about at BBQs is property news. Don't forget to check out my analysis of the apartment auctions. I was up at 5am this morning working it all out. OMG ZS look at what they say about us! Just got back from a few Open Homes and I'm pleased to report that each of them is buzzing with viewers, even the plaster ones! I know right? Anyone would think the topic of this web article and comment thread wasn't about house sales. I am currently waiting to hear the results of an auction in Te Atatu. Maybe we are obsessed? Which kind of property addict are you ... Maybe this ... From an article in The Guardian of August 2104. I especially like the last sentence. I'm not being nasty to you guys, I am constantly amused by your postings on Interest. Keep up the good work and all power to you, just hope you don't get too hurt when prices go down which they surely will sometime in the future. Completely unsustainable what is happening IMHO. So instead of being OCD maybe you are this .. From The Guardian. Amateur estate agents and house price hobbyists, Price Prophets inhabit Rightmove, Prime Location and Zoopla to obsessively recalculate the value of their home. These self-confessed property pariahs are always in touch with trends and consider themselves to be financially savvy. Obsessive when it comes to property portals, the spreadsheet sifters know exactly how their investments are performing and where they need to improve on their returns - especially when it comes to property equity. These investors and wannabe developers will tell you the value of their house, and yours, unsolicited. Don't sit next to them at a dinner party. Schizophrenia is entirely understandable and nothing to be concerned about. Debord suggested its a logical outcome for a capitalist society in its declining phase. He was a good man Debord, but complex.. Which one is Dr Jekyll and which one is Mr Hide? Spelling Zachary spelling. It's Mr Hyde or was Mr Hide some kind of clever play on words and I am being the slow one? I was a bit amused by that myself, the 1 Gb/sec robot isnt too good on spelling. Doh! This is what happens when you overclock the CPU. Someone really needs to develop a spell-checker with advanced A.I. Yikes that's $1,310,000 over CV. The auction I was observing, as a relative has a house next door, was CV of 790K and sold today for 1,220K. Zach do you have a life outside property obsession. I feel so sorry for you. A wonderful old friend once said to me, "life is all about people not things." Are you married and have children? Sometimes I wonder whether you are just a machine as you are on here so often. Your wonderful old friend probably said that before the Internet really took off. I've just done a quick count and we have 26 Internet connected devices. I'm kind of permanently plugged into the matrix, a computer-human hybrid. My wife and children are all plugged in too - thank goodness for unlimited Ultra Fibre 100. More than 26 active devices? Yes it probably is over-kill but damn impressive. I didn't even know it was available locally. Just for bragging rights it may be worth paying the extra for. Also virtual reality headsets should work well with it. Well guys methinks it's time you two got a room! It's obvious you have a mutual admiration society going. You guys are actually very funny. We will miss you when the correction eventually comes. Out of interest will you be advising interested parties when to sell? I think doublegz has already advised that now is a good time to sell if you are pondering selling. Our observations have shown that it is easy to sell in the current market, especially in Central, South and West Auckland. I'm sounding like Gin's The Price Prophet again! If a correction came I would advise not selling but hanging on, which is a Trump strategy. If you can just idle along, hang on in there. I have been overly active here at Interest only because the doomsters were claiming the decline had arrived however that was at odds with what I was seeing. I bought a two bedroom unit in Central Auckland in December and was feeling a bit sensitive about prices. Incidentally I am not a rapacious Landlord and have tended to end up as one accidentally, the last purchase done in order to keep a roof over an older couple's head when their Landlord had decided to sell. Earlier purchases were made simply to make moving house as stress free as possible after suffering acute stress when placed in a position where it was vital to sell on auction day. I even offered to sell a property to a long term tenant at a discounted price but was turned down which was unfortunate because the new owner has a property that has appreciated 250K in the last three years.
" I have been overly active here at Interest ..." ..."I bought a two bedroom unit in Central Auckland in December and was feeling a bit sensitive about prices" Dr Smith (as you have asked to be known as) you have just confirmed my suspicions about your motives for the multitude of postings. You are just like everyone else out there in property owning land (myself included) and that is when we purchase what is ultimately the biggest asset of our lives, soon after purchase we try to justify the price we paid for it. It's okay Dr Smith, rest easy, stop being obsessed and go outside and play. The market will look after itself and you cannot force it's hand one way or another. Can always go private. St Kent isn't too bad...they even have musical production such as Sweeney Todd to wow the nation. Following on from what I was saying this morning others are saying the days of Offshore Trusts are over. Article also says NZ Goverment is investigating NZ residents who have foreign trusts. These articles have a familiar ring to them! Ya"all do know doublegz and Zachary Quack are the same person don't you? So effectively 90% of the comment thread, is written by one man. Good grief! And frazz, don't engage gordon, he is as self entitled as doublezach... Come to think about, it all three could be one and the same. I am not self entitled like the person behind ZS and DZ. I am not a landlord as I only hold properties for my children and my wife and I to live in. I worked hard for 30 years and retired at 58. I live off dividends from public and private companies. I did not travel until I was 42. Through my children I know large numbers off X And Y. Unlike myself they are vastly travelled at a young age. I see very little saving going on for the first home deposit. I do admit the boomers whom I dealt with as a professional have been very lucky. They were able to leverage off their homes and buy rentals when they were cheap. Of course many have bought far more than they need to live off which has contributed to housing price increases. I myself admit I have been lucky as to when I was born. It was easy to save a deposit for the first home as we had very little to spend money on. Today there is much more to spend savings on especially the travel industry which loves taking money out of our pockets. X and Y need to be stronger in terms of saving than they currently are. I prefer to be called Dr Smith. Yeah, and when in the zoo you don't feed the animals. The Chinese community are very much into speculating on the full sections as they believe with further migrant inflows zoning for in-filling will be relaxed in the future. It make sense to try and predict the future. Auckland is going to get another half a million people over the next ten years. ......half a million people...we should be shyyyyting ourselves at the shyyythole that will result. But no, blind acceptance that we will become as overcrowded, polluted and crime ridden as the rest of the world. Yip blue meanie, I think you are correct! A kind of over excited schitzophrenic agent investor double act. Terrifying. To be expected, though. Sites like this are always full of Walter Mitty fantasist pretend tycoons. As another symptom of our society I saw audience in Sydney clutching ipads pointed at Bob Dylan get enraged if those around them asked the devices be put away as the screens are quite a distraction. This perfect consumer society is behaving in strange ways..again as Debord suggested..
Aren't those Jimi's lyrics? Also I'm thinking that (like Jimi) only the good die young...the old just invest in houses. "A hard rain's a gonna fall" and not just for the farmers. Gin - It's okay Dr Smith, rest easy, stop being obsessed and go outside and play. The market will look after itself and you cannot force it's hand one way or another. Okaaay, now doublegz and I get a lot of flak for what you might describe as being too exuberant. We are the ones saying let the market look after itself. So surely this advice should be directed at Gordon, exagent, SpaceX and the like. Couldn't agree more. The market is looking after itself in Auckland. After a good run up it is correcting down as all markets do. In winter the correction down will accelerate. And that was the gist of a lot of the discussion in March - was the market going down or going up in that particular month. It turned out it did go up in March which is what all the indicators were telling us and what we predicted. Now who knows what will happen for the rest of the year? We will have to wait and see. April property sales has started with a bang in Auckland from what I have observed. High-end properties are selling like hot cakes including this Ponsonby hovel that sold for $3.1m yesterday. I'm pleased that the new owners (who are from Auckland, not China) planned to completely renovate the heritage-protected property before moving in with their family. I see the 2014 'improvement value' is 60K. That price is really for the land alone. Freemans Bay full section #GoodBuy. Are you talking about the B &T figures for March which showed the average price rising because they sold more higher priced houses than in February. Hardly reliable data. Let's wait for the REINZ data for March which is considered the most accurate data by parties such as the RB. If the 3 of us start posting at the same time and using the same hashtag, it is likely that we will be tagged the same person again. I can't believe anyone would think gordon was us! I guess only the site owners can dispel this vile rumor by declaring our comments come from different IP addresses. Even then it may not be certain as we are pretty clever. Yeah that's assuming we both use static ip. The B&T auction at 10.30 on Wednesday only sold 6 out 15 properties so don't believe everything you read! Here's an insider info for you. 25 Ranui Road (a semi do-up) was passed in that morning and was sold within 24 hours for $2.72m, a cool 21% over CV of $2.25m. Also the owner only bought the property 4 years ago for $1.3m and pretty much did nothing to it. I also believe the other ones that weren't sold under the hammer have all been sold post auction. You know what I say is true. Thanks for the info. Tends to back up the recent trends. Lower valued properties have been selling 30-40% above CV whilst more expensive ones are quite a bit less. Definitely weaker at top end than low end where people are buying up the rubbish. Around $1.8m seems a bit of a cut off point. This is a similar trend to London. Top end very weak, bottom end strong. I hardly call this high-end. I suppose it depends on where you live, $1.8m may not even be enough for a 2-bed townhouse with no garden in DGZ. I would think less than 10% of properties sell for >$1.8m and so it would come under high end to most people. Discounts are partly in response to a glut of new homes in Canary Wharf, with thousands under construction. Investors are also being put-off by the new 3% additional stamp-duty rate on property bought as a second home or buy-to-let. True. My feeling is that we are entering a new phase globally in the housing market. Central governments have,for the last 15 years been very happy for property prices to run up as it has created very easy economic growth. With generation rent growing by the day they have realised that they have serious issues in front of them. So what I think we will see is growing invention from them to control market using unconventional methods. Using interest rates to control the property markets are a thing of the past. To use (put up)interest rates would be a tax on the poor.Top end/money laundered property doesn't need a mortgage. The UK is case in point where they have forced the overseas money out of the market. They have done it by added taxes-stamp duty as well as additional charges on overseas investors. They have also attacked the laundered money in the central London property market with greater disclosure. I'd love to know what its value was 7 years ago and I'm sure there would be a considerable difference before all the Overseas investor madness took hold. That house went up in value over 26K a month, every month, for four and half years. Does seem a bit crazy. Goodall said it would be hard for the same thing to happen again because banks were now more particular about their lending. "It was too easy to get ridiculous amounts of money, that's not so likely any more." Tuffley said much of the recent round of house price rises had been driven by increasing populations. "We are getting a bit of impact from investors looking elsewhere and buying into markets, putting pressure on but by and large what we are seeing is quite strong population growth. At this stage it doesn't look like anything problematic." DGZ is a complete waste of money. I went to Grammar when it selected the best kids from all over auckland the high achievers. These days its full of foreign robots and underachieving rich kids. Same with EGGS. Much better to send your kids to Kents or St Cuths these days you get a far better education and property for the money. Never come back! That shows your loyalty to your old school. It's ugly. No ugly is what it and Auckland has become, don't worry I wont ever come back. I think I know the one you mean. Full site and able to accommodate 3 subdivided sections under unitary plan. People are paying for land and the development potential. I'm an investor and so attend several auctions, opens and property viewings each week. I can't say Im surprised that property is moving and for record prices. I've been observing the activity for the past 3 weeks or so. I'm in a buying phase at the moment and it is tough to secure a property. Missed out on at least 8 in the last fortnight. I am worried the they are getting more expensive by the day and am eager to get something locked in. I think that's what you call FOMO! I do worry about the next generation and affordability, one reason I settled on property as my investment vehicle was that I'd have "homes" up my sleeve for my children, should they need a hand up. I don't see the market cooling off in the next 18 months without some major global event, but I'm certain the cycles will continue as they have always done.